This raises the possibility of developing drugs to regulate the activity of these genes to prevent HPV-associated cancers from developing and reduce the ability of existing cancers to evolve resistance to treatments. HPV (human papillomavirus) infection is widely known to induce cancer. Many of the mutations that cause this virally-induced cancer are caused by a family of genes that normally combats viral infections, finds new University College London (UCL) research. The research shows for the first time that genes from the 'APOBEC' family, which help to fight off viral infection, actually cause mutations that lead to HPV-associated cancer. This research was funded by the Rosetrees Trust, a charity dedicated to supporting pioneering medical research, with additional funding from the Debbie Fund and Cancer Research UK. "Genes from the APOBEC family encode proteins that modify the DNA of invading viruses, causing mutations that prevent the virus from replicating," explains senior author Dr. Tim Fenton, of the Tumor Virus team at the UCL Cancer Institute. "We now provide evidence that they can also cause mutations in our own DNA after HPV infection, leading to cancer." Over 99% of cervical cancers are caused by HPV infection, and HPV is responsible for approximately 26,700 new cases of cancer each year in the United States. Previous genetic studies have shown associations between APOBEC genes and cancer. "Our results show that after HPV infection, APOBEC genes cause very specific mutations, with very high frequency in a cancer-promoting gene called PIK3CA, thus leading to tumor development," says co-lead author Dr. Stephen Henderson of the Bill Lyons Informatics Centre at the UCL Cancer Institute. "It is not clear why HPV infection causes the APOBEC genes to misbehave and mutate PIK3CA. It could be that the body responds to HPV infection with increased ABOBEC activity, simply making 'friendly fire' more likely. Alternatively, there may well be something about the virus that causes the APOBEC response to wrongly target the body's own genes for mutation." Mutated PIK3CA (p110α) protein is known to play a key role in the development of a range of cancers, so it is a hot target for new drugs. The new research could explain why particular PIK3CA mutation variants are so commonly found in HPV-associated cancers. "While it is too early to consider targeting APOBEC genes to prevent tumor formation, it is nonetheless fascinating to work out how HPV drives tumor formation through their activity," says co-lead author Ankur Chakravarthy, a PhD student in the Tumor Virus team. The team's aim is now to learn what happens following HPV infection of cells in which APOBEC genes have been deleted. The research could also inform screening procedures, as there are variants of particular APOBEC genes that are known to affect cancer risk. For example, a variant of the specific gene APOBEC3B is known to approximately double breast cancer risk. This variant is common in East Asia, with approximately 80% of Indonesians carrying the gene variant. By contrast, only around 2% of the African population carries this variant. "Previous studies have shown that APOBECs cause mutations in a range of cancers but our finding that they mutate key cancer genes implicates them as drivers of tumor development, particularly in HPV-associated cancers. It will be interesting to see whether such APOBEC variants can predict the risk of developing cancer after HPV infections," says Dr. Tim Fenton. "If at-risk groups could be identified by genetic testing, this could have important implications for HPV screening and vaccination programs." 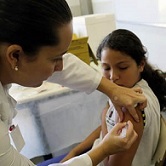 Illustration: HPV Vaccination in Sao Paulo Brazil, March 2014. –World Health Organization, source: flickr.